The June Bateman Fine Art is pleased to announce the first solo exhibition in New York of color portraits by Korean born photographer Eunsuk Joo. Karaoke Girl contains nearly thirty large scale chromogenic prints from Ms. Joo's Karaoke Girl and Eol-Gool series and is on view from October 7 through November 4, 2003. Since the mid 1990s, Eunsuk Joo has photographed strangers and acquaintances in Karaoke clubs and on the streets of New York City as a way of revealing and mirroring the experience of being an Asian woman in a non-Asian culture. 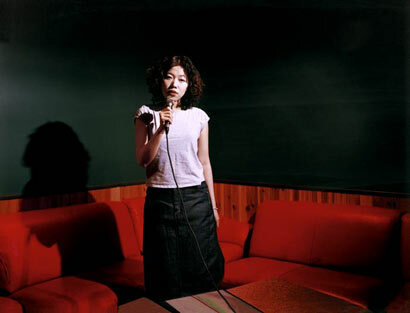 Joo's Karaoke Girl portraits depict not only the singers but also the environment and the video screens in Karaoke rooms on which images and lyrics are flashed, showing women engaged in the difficult, but essentially universal, process of coming to terms with themselves while situated in ambiguous circumstances. Prompted in their performance as lyrics scroll down picture postcard projections, emotions swirl out into the rented spaces furnished with black leather love seats and foil wallpaper, the seventies palates and disco sparkle adding strangely to the allure. In the tradition of such contemporary photographers as Nan Golden, Tina Barney, Rineke Dijkstra and her former instructor Gregory Crewdson, questions of identity and relation to cultural space are at the heart of the large-scale color photographs. And, although Joo's direct portraits might seem at first deadpan, ironic, even detached , beneath the placid technicolor surface of these austere portraits there is poetic paradox as doors to private and unfamiliar places open wherein many of us may recognize aspects of ourselves. In Joo's "Eol-GooI (Face)(1995-1996)" series, tightly composed, larger-than-life close up portraits of young Asian women confront the photographer and viewer. The young women's faces emerge luminous and abstracted from their surroundings, encouraging construction of narratives. "The aggressiveness of the form of these pictures, however, plays against the tenuous, half-defined quality of the subjects' expressions: as in the karaoke images, these are portraits of identities in process. Eunsuk Joo was born in Seoul, Korea, and studied literature before coming to the United States in 1991. She received a BFA in Photography from the School of Visual Arts and an MFA in Photography from Yale University. Ms. Joo has exhibited widely in New York and elsewhere in the United States, and is a regular contributor to Space magazine. She is currently an Instructor in the photography department of Parsons School of Design. A catalog, Karaoke Girl, has been printed in conjunction with the current exhibition, and is available for purchase through the gallery.